Mountain Laurel Montessori is a school for children between 16 months and 15 years of age (through 9th grade). 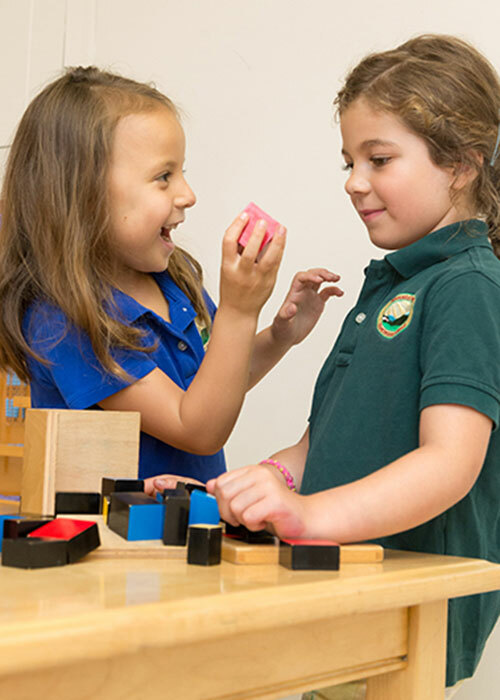 One of the beauties of a Montessori environment is that both children with learning differences and those with exceptional abilities can be equally challenged and engaged in their work, due to mixed-age grouping and a thoughtful, individualized curriculum. Mountain Laurel Montessori School admits students of any race, color, religion, and national or ethnic origin, to all the rights, privileges, programs, and activities made available to students at the school. We may not have immediate openings in some programs; however, when this is the case, submission of an application and application fee ensures that your child will be included on a wait-list to be considered for the next available placement. We prefer that children begin their Montessori experience by the age of 5, but we do accept older children without prior Montessori experience when we feel our school can meet their needs. Decisions are based on the needs of our learning communities and appropriate age and gender balances. "I met and fell in love with Mountain Laurel Montessori School in 2000--it was a wild and wonderful time in our family--I was learning and growing as much as my 2 and 4 year-old. When I found MLMS I jumped in, let go (as much as I could!) and lived MLMS with my boys until they graduated from the Junior High School (we all still call it "The Farm") in 2010 and 2013. It was one of the wisest parenting choices I ever made.